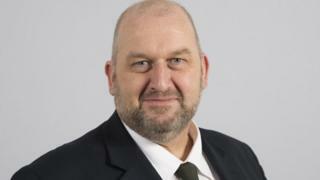 Sacked Welsh Labour minister Carl Sargeant's provisional cause of death was hanging, an inquest has heard. The 49-year-old married father-of-two, who had been Alyn and Deeside AM since 2003, was found dead at his home in Connah's Quay, Flintshire, on Tuesday. He was found four days after being sacked from his job as cabinet secretary for communities and children. At the opening of his inquest, coroner John Gittins said it was "an apparent act of self harm". Mr Gittins added he would carefully examine "the steps taken by the assembly to have regard to Mr Sargeant's mental welfare prior to his death". The inquest in Ruthin, Denbighshire, was told Mr Sargeant was found on the floor of the utility room by his wife Bernadette. Family members attempted to resuscitate him before paramedics arrived and continued those efforts, but the former minister was pronounced dead about 30 minutes later. Mr Sargeant was facing a party investigation into claims about inappropriate personal conduct and was suspended from the Welsh Labour Party prior to his death. He was removed from his role amid allegations he had "touched or groped" a number of women. Mr Gittins, coroner for North Wales East and Central, said the inquest would not consider the veracity of the allegations made against Mr Sargeant, nor would he be "looking to Cardiff and the Welsh Assembly or the Labour Party" about who was right or wrong and who could be trusted. He said he would be seeking statements from First Minister Carwyn Jones and possibly others at the Welsh Assembly in the coming weeks, but was not in a position to say whether Mr Jones would be called to give evidence. No date has been fixed for the full hearing as the coroner said a separate independent inquiry could have an impact on his responsibility to compile a prevention of future deaths report. He ended by assuring Mr Sargeant's family, friends and colleagues that "there will be a full and fair examination of the matters which are relevant to my investigation and that I shall not allow the inquest to be a trial by press, politics or personality". Mr Sargeant's family called him "the glue that bound us together" and said they were "devastated beyond words". Mr Jones said he was "shocked and deeply saddened" and paid tribute to "a friend as well as a colleague". Labour leader Jeremy Corbyn said Mr Sargeant's death was "deeply shocking news" while Prime Minister Theresa May said her "heart goes out to Carl Sargeant's friends and family". Mr Jones sacked Mr Sargeant from his frontbench after the first minister learned of a number of alleged incidents involving women. There will be an independent inquiry into how Mr Jones handled the case. Meanwhile, fresh claims about bullying in the Welsh Government have been made by a former adviser to Mr Jones. Steve Jones said he agreed with former cabinet minister Leighton Andrews, who has described a "toxic" atmosphere at the top of the administration. For support, Samaritans are available 24 hours a day on 116 123 in the UK and Republic of Ireland.